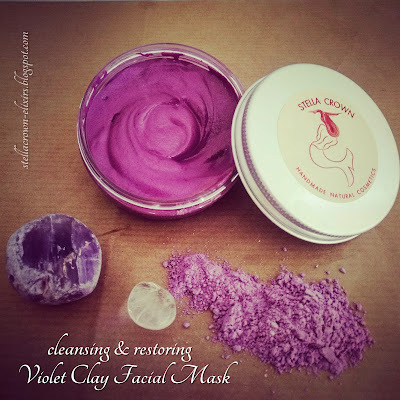 It's been a long time ago since we made a facial mask and that’s why I decided to try a special clay that is suitable for all skin types and is specially for dehydrated, dull and mature skin types. Today, we will play with violet clay which is basically a combination of white clay with a natural pigment (ochre). It absorbs dirt and toxins, stimulates the skin's elasticity and brings back the brightness to your face. 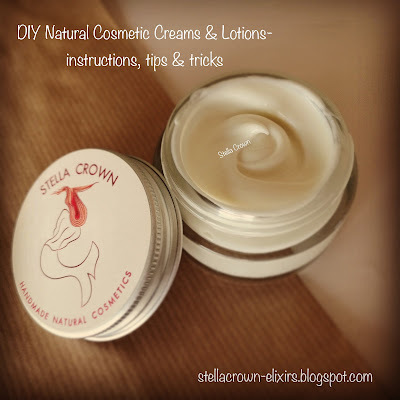 It is very effective in softening and cleansing the skin, soothes and moisturizes. At the same time, we could talk about chromotherapy as purple is a color that soothes the mind, relaxes from anger and anxiety and promotes mental balance. In Chinese medicine purple is supposed to harmonize energies, then purple clay is considered ideal for softness and harmony in mind and skin. Before you start making the mask, sanitise tools, containers, work surface and wear your gloves. In a beaker, pour the violet floral water and add the clay slowly, while stirring with a stainless whisker until the mixture gets homogenised. Add more water or clay if needed. Add all the other ingredients, stir thoroughly and the mask is ready. Apply the mask all over face and neck, avoiding the eye area. Let the mask act for about 20 minutes and then remove it with lukewarm water. Apply then your facial moisturiser. Violet water has softening, cleansing, anti-inflammatory and aromatic properties. It deep hydrates your face, for smooth and youthful skin. Aloe vera gel is astringent and softening, centella asiatica oil improves blood circulation and detoxifies the skin while borage oil is an excellent moisturizing and anti-aging agent that restores elasticity and shining to your skin. Provitamin B5 ensures rich and deep hydration, as it tends to "fill" fine lines and wrinkles, vitamin E softens while Q10 coenzyme protects against free radicals.